but many good memories of great fishing days. Do you remember Dicky, the guy at the Seal Beach Pier that would splash an iron tied to a rope and say he was ironing the ocean? Got the guys to go fishing with me after telling them about the awesome bonito bite. Got to the pier about 10:30am with 4 amateur freshwater fishermen. Looked into the water and mass balls of bait were visible (sardines). Sardines were instant on the Sabiki rig, but the bite started out slow. My buddy got picked up about 30 minutes into fishing, but was cherry picked, and then at about 11:30 or so the bite was on! It was instant once the bait hit the water, and there were a few times when we were all bendo, I never get tired of seeing that! I managed about 8 or 9, that’s in between catching bait, and retying hooks; the other fellas got about 4 or 5 each. Between the 5 of us, 12 fish were kept, and the rest released to fight another day. It’s interesting how passerbyers questioned me about fly-lining a sardine into the water, but what’s even more interesting is seeing the look on their faces and hearing their remarks when 5 bonies boiled on my bait… All in all a beautiful day to be fishing, even better, four more guys hooked on to pier fishing, “this is way better than using Powerbait,” it was music to my ears. Oh yea, all the fish were about 15-in or so, with a few big boys mixed in, maybe about 20 to 25 inches, but none of the big guys hit the deck, just followed the hooked fishes, and two short wsb caught and released (22-24inches). Get em while they’re hot. During the warmer months, the lights from the boat launches near the end attract tons of queenfish. This in turn attracts predators to the feast. I have caught several big sand bass throwing Fish Traps under the pier near the fish cleaning station. Otherwise, the mid pier area near the lifeguard tower can be good for bat rays and thornbacks if you like that kind of thing. Time From Sat night to 7 am Sunday. Hoop: Ambush Promar with perch and squid. Had some nice company to start off with. After about the 2nd set with the hoopI got crabs…good size crabs. A lot of keepers too but since they were jumbo female I decided to let the breed one more year. Around 2am I got hard hit. I have cord around my rod to keep it from flying off. My rod was dancing over the side. I rush to it. Push up the drag. Shaking heads and mad dog runs…I so found myself near the surf. It breaks the water line …Its a 5ft T shark. Then it make another run…I push up the drag more trying to get it back into the surf zone….the it makes a mad dash under the pier =( only got 30lb line…it breaks. I cry a little. Call for a ride home after thinking about what happened at 5am. My buddy’s said “What the hell was your plan to land that monster?” I replied “To bring him into the surf and bleed him out” My buddy replied “I think that was his plan to LOL”. He went back to sleep and I toss out one more rig waiting for my ride. 20mins later I get hit hard again. But It only was making short runs out into the open sea. So I put the drag low walk over to the surf. By now the morning crew guys are starting to show up and watch the my drama. I get it in the surf. Monster Battle. 4-5ft Wings span. Its head alone was about 15 to 22in high. A young boy offered to hold my rod so I can run down the pier to the surf and take care of it. I really didn’t know what was thing until Im looking this monster in the eyes. I thought “Now what you got all the people watching you”. So I ask for some pliers and cut the line. But the big boy is far to big and heavy to make out on the surf. He still had his barb. So I took a clip off my key chain and some shoe string. Broke of the clamp. And put it under his jaw. Then moving in front of him into the surf I was able to get him out enough for him to swim on his own. I freak for a few moments because I’m thinking I might step on him or get hit. But he made it out fine. The sad part of this was I set the boy like in an old western movie to get my friend to come down and help. The boy came back and said this “He said your on your own deal with it”. I was like WTF?. So after battling.. running down the pier…down the sand….thinking hard and fast and getting soak wet in Jan I make my way to the car. We pack up and here I am to tell you this story. Lest night at seal beach ever. Sorry no pics of the monster battie since my buddy never came. But there a few pics of the t fight. Head on down they are hitting the squid high in the water. <*}}}}}}}}}>< — Fish and Game fish surveys done from 2004-2009 show 27 different species and a somewhat typical list of species for a SoCal sandy-beach pier. The species (numerically) — jacksmelt, yellowfin croaker, Pacific mackerel, queenfish, walleye surfperch, Pacific bonito (all fish from one year), topsmelt, white croaker, Pacific sardine, spotfin croaker, California corbina, shovelnose guitarfish, shiner perch, California halibut, white seabass, barred sandbass, black croaker, black perch, bat ray, gray smoothhound shark, California scorpionfish, sargo, opaleye, jack mackerel, barred surfperch, silver surfperch and petrale sole (probably a similar sole). Strange is the lack of a round stingray considering the following story. 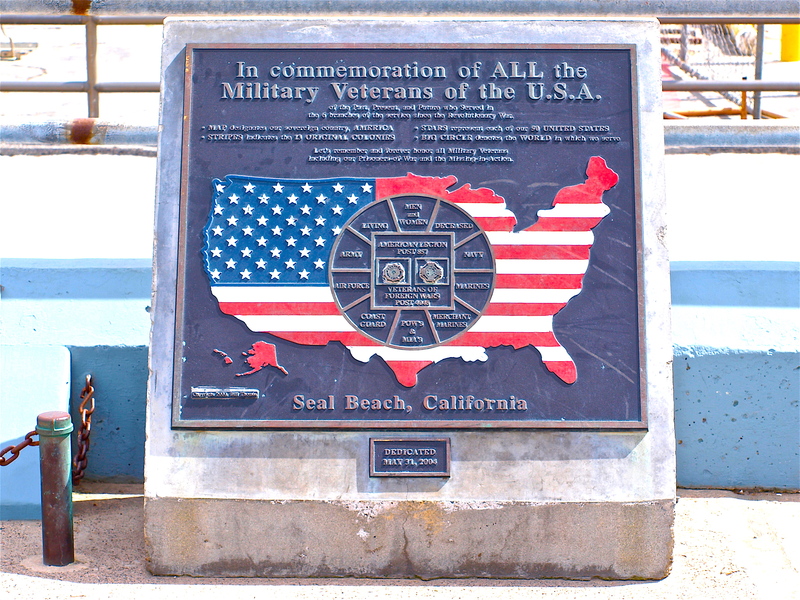 <*}}}}}}}}}>< — Seal Beach is “Stingray Central” for both California and the nation. In fact, residents sometimes call the local waters “Ray Bay.” One fourth to one third of the entire nation’s wounds from stingrays occur on the mile-long beach that is home base for the pier. Therefore, don’t be too surprised if you pull in a round stingray when you’re fishing in the shallow, inshore surf area. <*}}}}}}}}}>< — One visit saw me sharing the railing with “Bill,” a youthful 82 years of life. Bill had a million and one stories to tell but this book only has room for a couple. One was his story about a granddaughter and her first yellowtail. According to Bill, all anglers must eat the heart of the first yellowtail they catch. Sure enough, when he took his granddaughter fishing (on a partyboat) she caught her first yellowtail. Ditto several other anglers. Kiddingly, the deckhand cut out the hearts of the fish and offered them to the anglers. No one took up the offer until Bill’s granddaughter stepped up, took a swig of coke and gulped down the heart. The older anglers, now embarrassed, were forced to follow. A second tale concerned his use of “Mexican anchovies” to catch big fish like yellowtail. “What,” I asked, “is a Mexican anchovy?” “Simple,” Bill said, “it’s a strip of mackerel cut thin to resemble a large anchovy or sardine. It’s cast out, allowed to sink a few feet, and then reeled in very quickly. It kills the fish.” The gospel according to Bill! <*}}}}}}}}}>< — If the pier and surrounding beach area looks familiar to you, it may be because both were main settings for “Sunset Beach,” the NBC soap opera that ran in the late ‘90s. The saucy show didn’t seem to reflect the “small town” character of Seal Beach but most local citizens didn’t seem to mind. They were proud of the attention their town received and didn’t object to the money the movie company poured into the city’s coffers. Although some locals worried that a mob of curious fans might descend on their city, others pointed out that didn’t happen in the past when the area was used for films. Back in the ’20s, when Cecil B. DeMille filmed the original silent version of “The Ten Commandments,” the local shoreline was used as the site for the parting of the Red Sea. If movie fans didn’t invade the beach to see “Moses” surely they wouldn’t invade the area for this show. Of course the actresses in “The Ten Commandments” were dressed a little more conservatively than the vixens in the TV show. 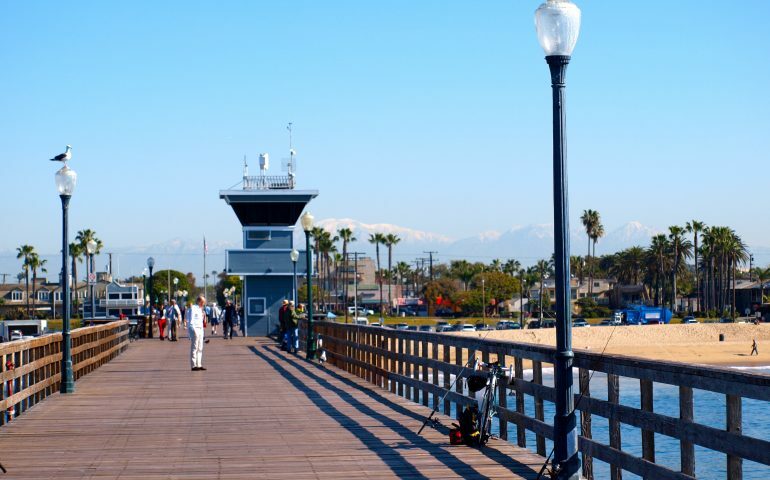 By the way, the romantic Sunset Beach Pier (where, according to legend two people would meet and fall in love) was of course the Seal Beach Pier. The pier and adjacent downtown area by the way seem to show up in many movies. In a scene in “As Good As It Gets” Jack Nicholson and Helen Hunt walk along a pier supposedly set in Chesapeake Bay. It actually is the Seal Beach Pier spruced up by the addition of several thousand lights.